Starting your own business and taking the plunge can be daunting, but help is here. With this setup plan, you will feel equipped and ready to take your idea to the next level. From market research to financing your business, this guide contains six key points to help you start your own business. Is there a place for you in the market? Think about what you are offering and how it can attract the customers from the competition. Is there too much of what you are offering already in the area? If you want to open a hair salon, is there already two or three on the same street. What is going to make your service/product stand out? Does your business stand a chance against the competitors, in terms of having your own niche? Who is your competition? To get a good idea of how to run a successful business, take time to look at the competition, what are they doing well? What makes them a worthy competitor? What could they be doing better? Answering these questions for your competitors, will give you an insight as to what a successful business looks like. Use your market research data, and have solid data backing your idea. This will make it clear what you are selling, who you are selling to and what exactly is your competitive edge over your competitor. Remember, you believe that your business idea will be a success, and in your plan, you are trying to make the investors believe in your idea. Have long-term objectives, this will show investors about the realistic opportunities and growth that the business will have. Also include small milestones, which are likely to be achievable in the near future. By highlighting these, you are setting real goals to show progression and growth of your business. 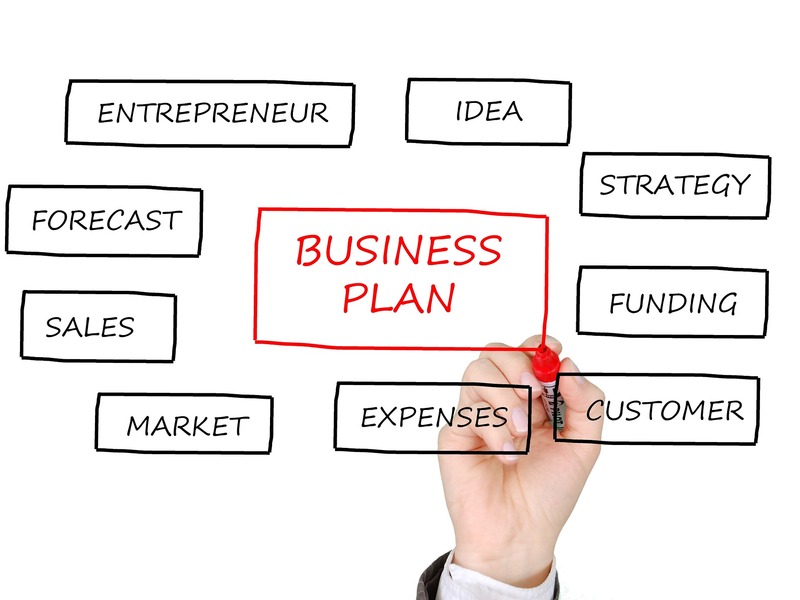 More information on how to write a business plan. Sole Trader – It is perhaps the simpler to set your business as a sole trader, however, the whole business is your responsibility including any business debts. As a sole trader, you are self-employed. This also means that all profits made are for you, however, you also have to face any losses that the business has made, which will affect your personal finances. Partnership – The partnership model is an extension of the sole trader structure. When two or more people want to start a business it qualifies as a partnership. This means that the responsibility, as well as any profits, are shared. All partners must pay tax on their share and also share the responsibility for any losses that the business might have. Limited Company – By opting for the limited company structure, you have less pressure on personal finances. By choosing this structure, your personal assets can be safe if your business does not work as planned. However, this particular structure does involve completing more paperwork as well as deciding how you will get paid. There are few options as to how to get paid such as a salary, dividends or directors loans. Whatever is the most suitable method, the appropriate paperwork must be completed to accompany the payment method. A good limited company accountant can help you with all of this. Creating the right company brand and image is one of the most significant parts of having a business. Image and brand are everything when it comes to attracting the right customers. In order to create the right brand you have to know your customers, what will resonate with them, what are their wants and needs. You have to look at your brand as a character and make it everything your business embodies. Choosing the right name and logo for your business is crucial. When choosing a name, make it short, easy to spell and memorable. With the logo, opt for something that represents your business well but it is memorable and unique. Find out more about choosing the right name for your company. Asking friends and family for a loan and/or investment. However, this again has the risk of causing problems in personal relations. Bank loans – as with any other aspect of starting your own business, you need to do your research. Know what you are looking for, what kind of loan you are looking to get from the bank. Selling your idea and getting a bank loan can be a challenge, you may have to face rejection several times. However, if your pitch is great, then you may just sell the idea and get the loan that you need. Apply for a start-up – these are government-backed loans ranging from £5, 000 to £25, 000 and are charged at a fixed rate of 6% per year. These are beneficial, as the successful candidates can also get mentoring and help with a business plan. Angel investing: This is when the angel investors provide investment in your business in exchange for a share. The main benefit is the investment finances coming in as well as the investor losing the money if the business does not go well leaving your personal finances unscathed. When starting your own business you need to be legal smart. Make sure you have researched all the legal requirements, regulations, tax information and any other law that may affect your business. Tax law – There are five different tax laws that you need to be aware of: Income tax, national insurance, corporation tax, VAT and business rates. Also, make sure you keep up to date with the tax rates, that change every new financial year. Employment Regulations – If your business is growing or you need staff from the beginning then make yourself aware of employment regulations. These will make you aware of your responsibilities as an employer and create a professional relationship between yourself and your staff. Some of these employment laws include; providing your staff with a form of a pay slip, highlights the gross salary and any deductions made. Giving statutory pay to your employee on the fourth day of sickness/illness. More on employment and staff here. Small business insurance – There are different types of insurance that are available to you as a business owner, there are some that are compulsory and some which are recommended. The insurance that an employer has to have is employer’s liability insurance. This insurance is a legal requirement. Others that you can choose to have are professional indemnity insurance, public and product liability insurance, building and content insurance. Following these six steps will give you a good starting point on your journey as an entrepreneur. For more on how to start your own business check out the rest of our start-up guides here.